Whatever headway the U.S. gained in Iraq following the 2007 surge has for the most part come undone — paving the way for the rise of the Islamic State. That's the assessment of retired Army Col. Peter Mansoor, who had a front-row seat for the surge in his capacity as executive officer to retired Army Gen. David Petraeus in Iraq from 2007 to 2008, the culmination of Mansoor's 26-year Army career. When the last U.S. troops left Iraq on Dec. 18, 2011, following several years of drawdowns, al-Qaida was defeated, but was not irrevocably destroyed. "We had al-Qaida down on the 10-count, and we let it off the mat," Mansoor said. And, he added, from those not-quite-extinguished ashes rose the Islamic State, also known as ISIS or ISIL. 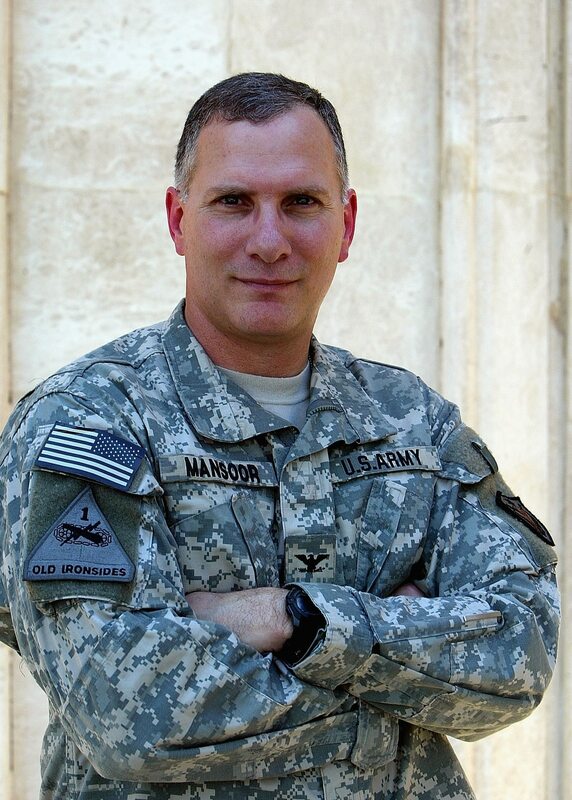 After his deployment as XO to Petraeus, Mansoor retired in 2008 and went on to publish two memoirs detailing his experiences during the surge. He's now an associate professor at Ohio State University, where he teaches military history. Speaking at a discussion Wednesday at American University in Washington, D.C., Mansoor assessed the Obama administration's approach to Iraq and criticized several key areas. Citing a general "unraveling of the security situation around the world," Mansoor stressed the need to "know who your enemy is." ISIS is an entirely new kind of adversary, a "hybrid enemy," he said. "And to combat a hybrid force, you need a hybrid force." That requires an unrestricted approach. President Obama's proposal for a new authorization for the use of military force in Iraq in February is a good start, but doesn't go as far as it should, Mansoor said. "The authorization shouldn't be constrained geographically because the president needs to be authorized to combat ISIS wherever it exists," Mansoor said. "It shouldn't have constraints on number and type of force … [and] should not rule out ground forces" because they are integral to any functional, comprehensive approach to defeating ISIS. He suggested that any effort to retake the strategic city of Mosul, for example, would require troops on the ground. "If you rule out those uses of force, then achieving our goals becomes much more difficult." And drones are not enough to win this fight, he added. "Unfortunately, this administration has used drones — which are a tool for war — as a substitute for strategy." Mansoor said U.S. strategy today "is to support the Iraq government with air power and advisers that do not accompany troops into battle, but train them." He argued that is not enough, and that maintaining close, continuous involvement with the Iraqi government should be a priority. "That's what we're not seeing from the Obama administration," he said. The lack of close collaboration has created missed opportunities, in Mansoor's opinion, among which was the chance to support a moderate bloc within the Iraqi government — when there was one. Moving forward, the U.S. approach needs to acknowledge the changing reality with Iran, Mansoor said. "Iran sees the Islamic State as an opportunity," something akin to a distraction because if Americans are preoccupied with the threat posed by ISIS, Iranian leaders think the U.S. will overlook its grievances with them. "But we need to learn to walk and chew gum at the same time," and deal with both fronts simultaneously, he said. That means weaning Iraq off Iran, Mansoor explained. "Right now, Iran has its tentacles deep into Iraq," which he called bad news for the rest of the world. Mansoor believes America's best bet is an international coalition, and should include soliciting more support from Turkey in terms of shutting off the flow of fighters and oil into Iraq. "Turkey needs to be onboard," he said, but . they haven't been fully cooperative. Mansoor also suggested that Obama appreciate his influence over the American people to get their support for broadening the fight against ISIS. "Right now, we have an administration that's engaged diplomatically, but because they're taking off the table much of the military [functionality], no one believes them," he said.